Our prowess in the Y type strainer is apparent from our wide collection of the strainer, among the inline Y strainer is one of that we have precisely designed to protect pumping system components. The 304 SS screen is incorporated accurately in this inline Y strainer to eliminate unwanted debris and other sediments and prevent the plug up, which is a general cause of the damage. The strainer is made using the forging technique by means of the brass material in order to impart the considerable strength against high pressure and temperature surrounding and ensures a longer lifespan of the same. The entire manufacturing process is quality controlled and enacted under the strict surveillance of the quality analyst team in order to obtain the second to none quality inline Y strainer that is a truly reliable affair to protect your pumps from the damage. This inline Y strainer can be installed vertically as well as horizontally as per your requirement, where in brass drain point is equipped to remove the impurities filtered from the petrol, diesel, oil, etc. 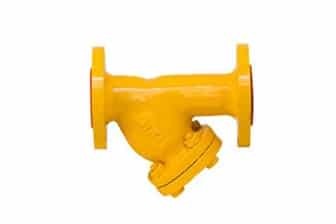 We provide this inline Y strainer in the assorted specifications as per need, which each compliances with the ASME standards as well as API standards and hence guarantee impeccable performance all through.